Physically, Sonora Pass is a low point along the North-South orientation of the Sierra Crestline where Highway 108 links the Eastern and Western flanks of the Sierra Nevada Mountains. Road Map. The Pacific Crest Trail's North-South route along the Sierra Crestline travels across Highway 108 at Sonora Pass. The high point to the South of Sonora Pass is Leavitt Peak sitting upon the massive bulk of the Leavitt Massif surrounded by subordinate peaks. To the North the PCT winds its way around the South and Eastern flanks of the great triangular bulk of Sonora Peak. 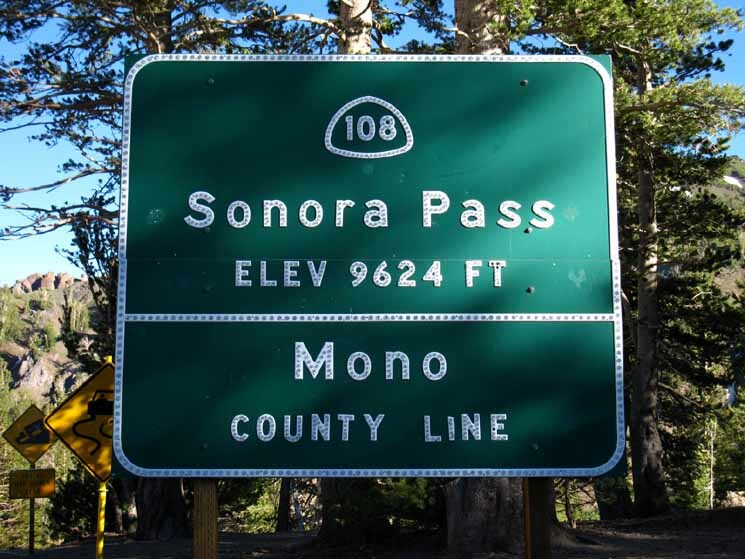 Administratively, Sonora Pass is the point along the North and South alignment of the Sierra Crestline that intersects with the East-West route of Highway 108. Highway 108 and the Sierra Crestline itself are the boundary lines crossing to divide the various administrative authorities that intersect at Sonora Pass. The history of these administrative units and Sonora Pass itself are based on the Western expansion of the United States in the second quarter of the 19th century. The Sierra Crestline running North and South through Sonora Pass divides the authority of the Toiyabe National Forest along the East Flank of the Sierra Nevada from the Stanislaus National Forest's jurisdiction over the Western flank of the Sierra. The Toiyabe National Forest spans from the Eastern flank of the Carson Range around the East shore of Lake Tahoe South down the Eastern flank of the Sierra to where it wraps around the Eastern Boundary of Yosemite as the Hoover Wilderness down to Highway 120. The Stanislaus National forest stretches from a bit North of Highway 4 South down the Western flank of the Sierra to and around the North and Western Boundaries of Yosemite National Park. Highway 108's East-West vector across Sonora Pass down the West Sierra flank marks out the boundary dividing the Carson-Iceberg Wilderness on the Northwest side of the Sierra Crestline from the Emigrant Wilderness on the Southwest side of the Sierra Crest. The Emigrant Wilderness to our South and Southwest wraps around the Northwestern boundary of the North Yosemite Backcountry. Both the Toiyabe and Stanislaus National Forests run North & South of Highway 108, but only the Stanislaus administers the Emigrant Wilderness, which is located on the West flank of the Sierra crestline South of Highway 108. The Carson-Iceberg Wilderness to the North of Highway 108 lays across the Sierra Crestline with portions on both flanks of the Sierra Nevada. 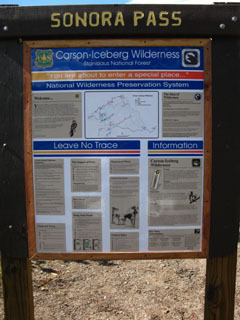 Thus the portion of the Carson Iceberg Wilderness on the West flank is administered by the Stanislaus National Forest while its Eastern side is administered by the Toiyabe National Forest. Call the Ranger District of your selected wilderness & National Forest hiking area linked to above for permit information. Sonora Pass is where the second highest East-West road, Highway 108, crosses the Sierra Nevada Mountains. The highest is Tioga Pass on Hwy 120 East of Tuolumne Meadows. Sonora Pass is also the first road Northbound hikers out of Tuolumne Meadows will cross (besides the dirt-no services Tungsten Road) after 74 miles on the trail. Sonora Pass also marks the point 1000 miles North of the US border for Pacific Crest Trail hikers. Most Northbound PCT hikers hitch-hike down to Kennedy Meadows Pack Station to pick up the resupply package they sent themselves. Well, virtually all long distance hikers stop to resupply at Kennedy Meadows Pack Station, PCT, TYT, or whatever. Kennedy Meadows splits the distance between Tuolumne Meadows and Lake Tahoe, no matter how we hike it. 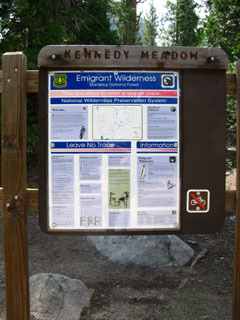 Many local and long distance hikers begin trips out of Kennedy Meadows or Sonora Pass. The next standard resupply spot North of Sonora Pass is 69 miles North at Echo Summit above South Lake Tahoe (Resupply at Echo Chalet or a hitch down to South Lake Tahoe), though PCT hikers can also resupply between Sonora Pass and Echo Summit by hitching 15 miles West down to the Lake Alpine Lodge from Ebbetts Pass along Highway 4. Lake Alpine accepts and holds resupply packages free for long distance backpackers. Highway 4 is located a bit less than halfway between Sonora Pass and Echo Summit. The Lake Alpine Lodge is less than a mile West of the route of the Tahoe to Yosemite Trail where it crosses Highway 4 to pass around the East Shore of Lake Alpine, and is a standard resupply stop for hikers on the TYT. For Southbound hikers Sonora Pass's 9643 foot altitude offers high altitude access to Leavitt Peak and the Emigrant Wilderness of the Stanislaus National Forest beyond. Though hiking Southbound from Sonora Pass begins along the Pacific Crest Trail soon many trails into the Emigrant Wilderness fan out into a web of trails that we can use to create a wide variety of excellent loop and trailhead to trailhead backpacking trips beginning from Sonora Pass. The following Southbound trail guide pages explore these options as we hike South, and so should you. Though this guide does follows the PCT South to Tuolumne Meadows in Yosemite it also links up with the Tahoe to Yosemite Trail North of Relief Reservoir via Kennedy Lake and at Grizzly Peak South via the trail over Big Sam. These trails can be used to link up the PCT and TYT route's divergent paths around Emigrant Wilderness to create long backpacking loops that mostly stay inside Emigrant Wilderness. Similar hiking options are available for Northbound hikers out of Sonora Pass. The PCT and TYT routes North of Sonora Pass are also connected by a series of trails that allow hikers to craft great loops around the Carson Iceberg wilderness. These are good warm-up trips if you don't quite feel ready to hike 74 miles all the way down to Tuolumne Meadows from Sonora Pass. Build the length and duration of your first short backpacking trips one step at a time. As you develop skills, fitness and experience expand the scope of your trips until you can easily hike the long trail South down to Tuolumne in Yosemite or North up to Lake Tahoe. Soon you will be hiking long trails like the Tahoe to Yosemite Trail, the John Muir Trail, and the whole length of the Sierra Nevada between Lake Tahoe and Mount Whitney. See it before its gone! Click Black dots for detailed maps, red dots for guide info. 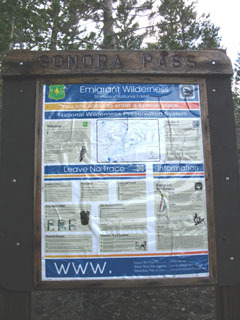 The Northbound TYT Trailhead is located along Highway 108 about a half-mile West of Sonora Pass. The Southbound TYT Trailhead is offset about nine miles down the West Flank of of the Sierra along Highway 108, then a mile West down a rustic semi-paved road to where we find the gate on the South end of Kennedy meadows Pack Station. Located Nine Miles down the West Flank along Highway 108 to the Kennedy Meadows Road, then one mile South. Road access to the Tahoe to Yosemite and Pacific Crest Trailheads in the Northern High Sierra. Clarks Fork Road to Arnot Creek (TYT), Disaster Creek, and Clarks Fork (TYT) trailheads. Highway 108 trailheads include Kennedy Meadows Pack Station (TYT South), Saint Marys Pass (TYT North), and Sonora Pass (PCT North and South). The Tahoe to Yosemite and the Pacific Crest Trails have trailheads in proximity to each other at Sonora Pass. The Pacific Crest Trail has both North and Southbound trailheads crossing Sonora Pass itself. The Tahoe to Yosemite Trail does not. Only the Northbound Tahoe to Yosemite Trailhead is near Sonora Pass, at Saint Marys Pass. 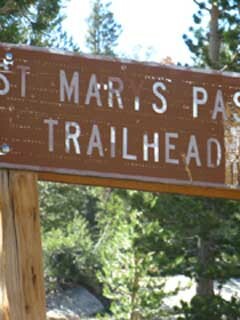 The Tahoe to Yosemite Trail's Northbound trailhead is the Saint Marys Pass Trailhead located a mile West of Sonora Pass along Highway 108. The Tahoe to Yosemite's Southbound trailhead is located about 9 miles West then a couple of miles Southeast off of Highway 108 through Kennedy Meadows Pack Station. There are no unmaintained trails along the TYT between Kennedy Meadows Pack Station South to Tuolumne Meadows. 1.14 miles North of the Saint Marys Pass Trailhead along the TYT route there begins a span of at least 6.25 miles of unmaintained trail and sections of NO TRAIL at all along the Tahoe to Yosemite Trail route to Lake Alpine. That's why I call the TYT a route, rather than a trail. Southbound backpackers arriving at the Saint Marys Pass Trailhead are marking the end of the unmaintained sections of trail along the Tahoe to Yosemite Trail route. Sonora Pass is the traditional resupply point for both Northbound Pacific Crest Trail hikers and Southbound Tahoe to Yosemite Trail hikers. Almost everyone stops at Kennedy Meadows Pack Station to pick up a pre-sent resupply bucket and eat fresh food, drink cold beer, and do a little R&R, depending on their personal schedules and goals. Resupply at Kennedy Meadows Pack Station requires a 9 mile hitch-hike West down to Kennedy Meadows from Sonora or Saint Marys Pass. We also have the option of resupplying at Bridgeport, 29 miles to the Southeast. To reach Bridgeport we first have a 12 mile hitch-hike East down Highway 108 to Highway 395, then another 17 miles South on Highway 395 to Bridgeport. I suggest and prefer Kennedy Meadows, but Bridgeport does have its drawing points, which I isolate as more food choices. If I hitch East off Sonora Pass out of the Sierra Nevada Mountains, I head North to visit friends in the town of Walker. Walker lays 14 miles North of the junction between Highways 108 and 395 12 miles West of Sonora Pass. Whichever way you go on Highway 395, North or South, the valleys spaced out like pearls on a necklace along the length of the base of the Eastern flank of the Sierra Nevada Mountains are stunningly beautiful, and generally inhabited by good folks. 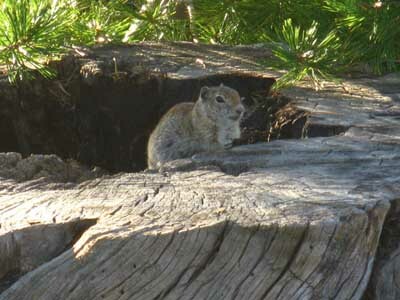 Four excellent sets of local trip options await local and section hikers out of each of the trailheads at Sonora Pass. Each of these trailheads offers an excellent range of short, medium, and long distance backpacking trip options. Each offers unique terrains and backpacking experiences. Each trailhead can be used to hike the whole section of that particular trail to the next Highway North or South. Each trailhead can be used to craft unique 20 to 90 mile hiking loops around the Carson Iceberg Wilderness to the North, and the Emigrant Wilderness to the South. Along the Highway 108 corridor we have two distinct routes North to Highway 4, and two distinct routes South to Tuolumne Meadows in Yosemite. The distances vary from between 29 miles North to Ebbetts Pass along the PCT, up to 75 miles South to Tuolumne Meadows following the TYT route. Each of the trailheads at Sonora Pass offers a wide range of excellent local loops and trips to other nearby trailheads. Semi-circle and potential loop routes link the trails out of the TYT trailheads to the PCT trails to both the North and South of Highway 108. Check out the road map below to also locate other nearby trailheads located on the Clarks Fork Road West of Kennedy Meadows Pack Station on Highway 108, and trailheads out of Leavitt Lake to the East of Sonora Pass on Highway 108. Take the time to explore your basic backpacking options out of Sonora Pass, and your explorations will be richly rewarding. Have a great Sierra Nevada trip or story to relate? A fine piece of gear? Or gear that failed?